QIM’s portfolio of products simplifies data gathering, processing and monitoring, reduces the learning curve and decreases total cost of ownership. Our products can help you gather, process and analyze more data and diagnose issues faster and more efficiently than ever before. QIM simplifies monitoring of the ETL applications with Web-based graphical tools that can report on the standard ETL metrics and allow for easy monitoring without the need for any client software. SysMon provides charts and graphs on system resource usage for quick and easy root-cause analysis, including files-pulled statistics, database-to-database rows-pulled statistics, parsed-files statistics, records-inserted statistics and any exceptions. Subscription email alerts support user-defined thresholds and tracing features to enable simplified error analysis from topology and fact tables all the way down to the raw data. 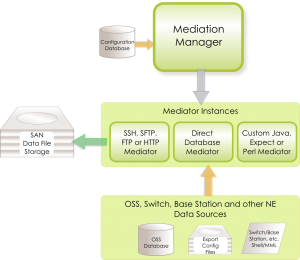 The QETL Mediator allows data transfer from various telecom network element data sources to file storage or other data destinations. It has the ability to be managed via configuration files and directly on the database. It also provides multi-server and multi-directional connection support to transfer data from one or multiple sources to one or multiple destinations. The QETL Mediator supports multiple protocols, file transfer options and authentication methods, so it can be easily integrated into your existing infrastructure. It has the ability to operate during planned or unplanned database outages and to perform auto-retry for failed file transfers. It features flexible scheduling with detection and management of truncated files and comprehensive Logging. The QETL Mediator supports predictive command-processing so it can simulate a user logging into one or more remote switches . It supports extensive array of login permutations and can execute one or more CLI commands on a switch. It can modify behavior based on command response and create a file from the output of CLI commands. Its command versioning allows MML pulls from multiple versions of the same element type. The QETL Mediator provides multiple file collections methods and allows multiple threads to push/collect more files simultaneously and support both batch and real-time data monitoring and collection. It creates comprehensive logs of all connection, transfer statistics and exceptions. The QETL Data Loader supports processing of thousands of files concurrently. You can configure the maximum number of concurrent parsers for each type on each data-loading server, giving vital types priority over other types. Data Loader allows for job distribution as well as different steps of ETL process running on different machines (Data Pipelining) and supports process separation. Split data streams allows data sources to be read once and loaded into multiple tables simultaneously. Clustering support allows seamless processing of files on multiple hardware sources as well as providing high availability. 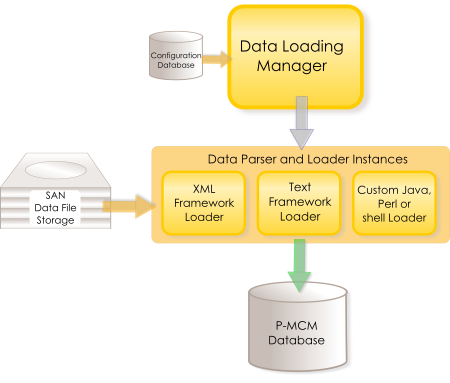 The Data Loader supports parsing for XML, CSV, MML output, compressed and unstructured data. Text Parsing Framework allows nearly any type of text file to be parsed and fast XML parsing using xPath registration. Pre and post-processing of data provides greater overall flexibility. As part of the Data Loader, we offer data validation to enforce quality standards. The database-driven configuration allows easy management for your enterprise. The QETL Data Loader's Java-based library build can parse a wide array of files with the ability to ignore pre-defined lines in a data file. Its mature and evolved framework requires no boilerplate code and performs fast bulk inserts rivaling Oracle SQL loader. Many behaviors are controllable via configuration requiring no code changes. The built-in logging tracks performance statistics such as total parser time, CPU time, I/O time and database time, rows inserted, rows failed and file properties (name, size, data date) for each file parsed. Logs and email alerts allow proactive response by your maintenance and operations team. The QETL Report Generator is a standalone tool which allows the user to pull tables or topology views from a database and send them to other systems in the form of a report. The reports can be generated in formats compatible with the target systems. The Report Generator supports retries for temporary failures caused by network or systems issues. Most updates to the generated reports can be made through simple configuration changes. The SysMon EVT performs automatic detection and reporting of network elements hardware and software upgrades.